The bill for incorporation was withdrawn from the Georgia General Assembly for further study in 2006 and passed only the lower house in 2007. In 2008, the bill of incorporation was re-introduced by Senator Weber, and due to increased pressure, it passed in the senate as well as the house. Georgia Governor Sonny Perdue signed the bill allowing the residents to vote for a city of Dunwoody on March 25. The referendum for cityhood, which took place on July 15, was approved by an overwhelming majority of voters. The Dunwoody City Charter was later ratified by the Georgia General Assembly, and on December 1, 2008, after a three-year movement, Dunwoody officially became a city. Dunwoody's geographic center is at 33°56′34″N 84°19′4″W (33.942751, -84.317694). According to the United States Census Bureau, the CDP had a total area of 12.1 square miles (31 km2), of which, 12.1 square miles (31 km2) of it was land and 0.04 square miles (0.10 km2) of it (0.33%) was water. Dunwoody lies at the northern tip of DeKalb County, bounded by the Fulton County line on the north and west, Interstate 285 on the south, Peachtree Industrial Boulevard on the southeast, and Peachtree Corners (in Gwinnett County) on the northeast. Officially, the city limit extends only to the DeKalb County line in the north. However, the name Dunwoody was previously used as far west as GA-400 and north to the Chattahoochee River. To this end, the Dunwoody name is present in the narrow Sandy Spring panhandle's many apartment complexes, roads and shopping centers (such as the Dunwoody Place Shopping Center). This narrow strip was originally part of DeKalb, but was then ceded to Milton County, which later merged into Fulton. Perimeter Mall and approximately 40 percent of the Perimeter Community Improvement District, is a self-taxing district of shopping and office buildings (including several high-rises), are both located in Dunwoody. The western part of the Perimeter Center edge city spans the Fulton county line into Sandy Springs. (The two sides of the PCID are legally separate, but work as one organization.) The tallest building in Dunwoody is the 34-story Ravinia 3, at 444 feet (135 m). Perimeter Center is served by the Dunwoody train station on MARTA's north line, while the other two stations in the area are both on the Fulton side. 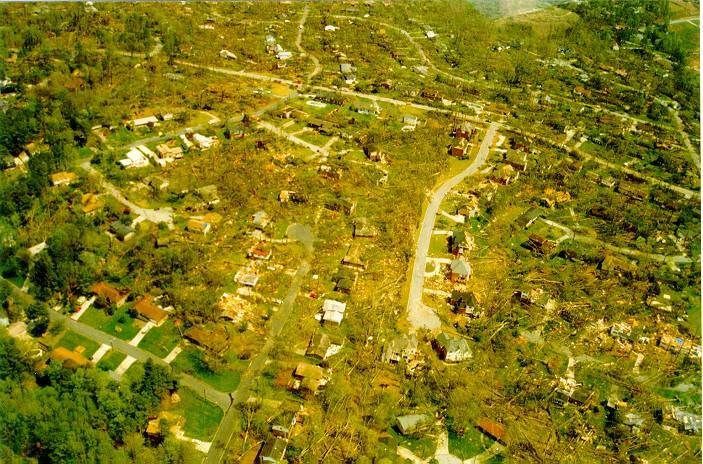 On April 9, 1998, a major tornado tore through parts of Dunwoody, running east-northeast from Perimeter Center and into Gwinnett County. Thousands of homes were damaged, hundreds seriously, and several dozen were condemned. In addition, tens of thousands of native forest trees were downed. The vast majority of the tornado's damage occurred here, leading it to be called the "Dunwoody tornado", the most vivid in local memory until the 2008 Atlanta tornado. The Perimeter Center skyline including Dunwoody, Georgia (center) and Sandy Springs, Georgia (left and right).